Dragon's blood flows in the veins of the Cocatrice, a creature half bird, half reptile. His flapping wings can disconcert the most formidable opponents. Woe to the hero who can not get it down at first, because it will not be so lenient. 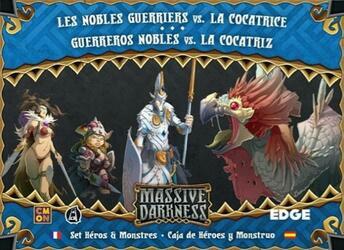 This Heroes & Monsters box contains a Wandering Monster, 3 Heroes, an Artifact and a new Class for Massive Darkness. The Cocaine is as deadly in Melee as in Distance. She is able to stop any attacker. The Noble Warrior is a natural leader and a specialist in teamwork. The three Heroes figures provided can be used during your games to replace other characters or add new ones.